Forwarding the Faith is a radio broadcast dedicated to the proclamation of the Word of God and the glory of Jesus Christ. In these days when neutrality, compromise, and apostasy are endeavoring to make inroads into many churches and Christian organizations, it is not a time for the change of vision, message, standard, or principle; it is a time to simply Forward the Faith. This 15-minute program presents a message from God’s Word from second-generation leadership that is desiring to maintain the biblical integrity and legacy of true separatist, remnant Christian preaching. May these broadcasts bless your heart as you listen to Forwarding the Faith . Dr. Hubert Talmadge Spence is both president of the Foundations Schools and pastor of the Foundations Bible Collegiate Church, Dunn, North Carolina. He is the first of three children of Dr. O. Talmadge Spence and Dr. Joye Spinney Spence. Married to Joy Kathryn Klepper of Oklahoma City, they have three children and six grandchildren. Although he was ordained in the Pentecostal Holiness Church at the age of 20, he left the denominational system with his father in 1974 because of the pervasion of the contemporary Charismatic movement. His father commenced the Foundations Ministries in June of that year. 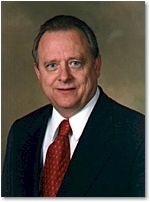 Dr. Spence became the vice president in 1980 and assumed the presidency in 1999. Dr. Spence has a doctor’s degree in theology and Bible and for many years has taught at Foundations Bible College & Seminary on the undergraduate and graduate level in the areas of Christian education, Bible, history, theology, music, and philosophy. He has traveled throughout the United States and many other countries presenting the Scriptures in the light of history, philosophy, and present trends that mark our society. He is presented in the Personalities of America, the International Biographical Society, sponsored by Cambridge University of England, Who’s Who In American Education, and has received numerous other biographical awards and nominations. As an authority in the area of contemporary Christian music, Dr. Spence has written an in-depth book entitled Confronting Contemporary Christian Music , which has been translated into Spanish and German and has been viewed by many professors of history, philosophy, and music as one of the most candid, plenary writings of insight on the subject from a conservative perspective. He has lectured on this subject in many churches in and out of the United States. Dr. Spence has written numerous books, sacred hymns, musical dramas, and sacred plays.